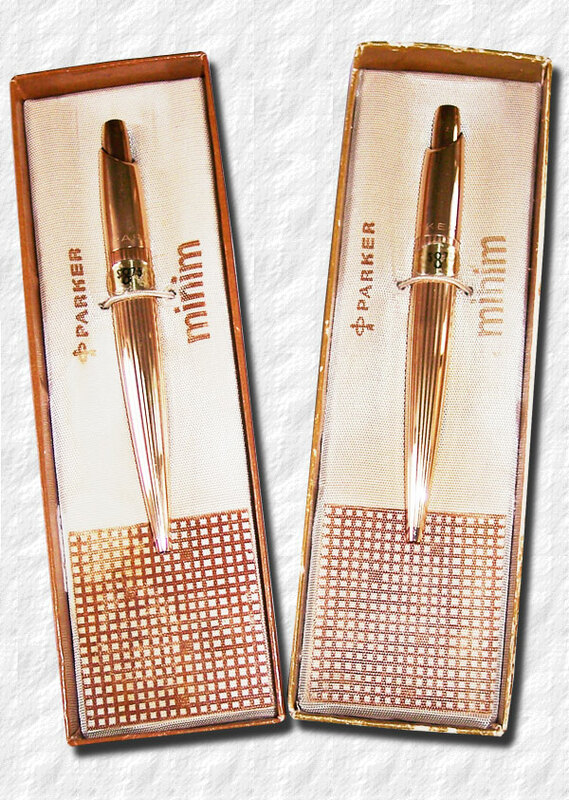 n the mid 1950's Parker was flooding the world with Jotters but Dan Parker wasn't a guy to lean back and take it easy. 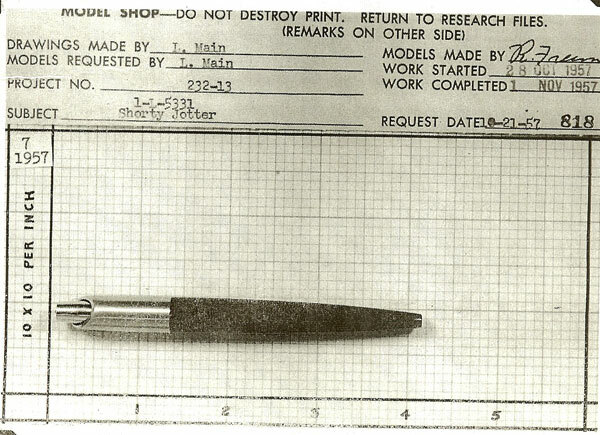 He wanted to produce a ladies ball pen, small enough to fit into a ladies chic hand bag. It was developed by Walter "Wally" Bieger, who was hired by Parker's chief designer Don Doman late in 1956. 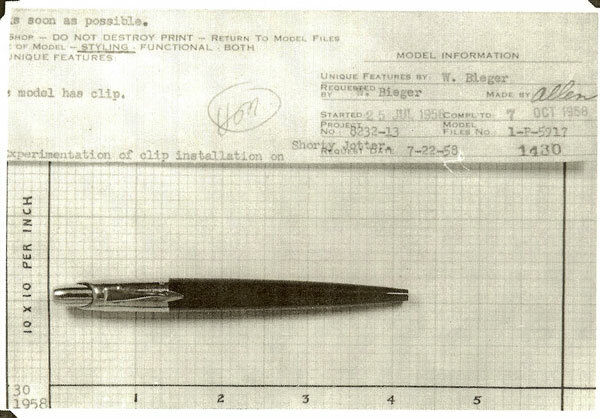 Bieger had worked with another Parker designer, Nolan Rhoades (who designed the Jotter), and Rhoades suggested that Bieger should try to set up a meeting with Doman. Don Doman must have realised his potential because he soon made Bieger his assistent. And when Doman, like Rhoades, later on decided to go into business by himself, Wally Bieger got Doman's job as chief designer at Parker and continued to hire both Rhoades and Doman as consultants for many years. 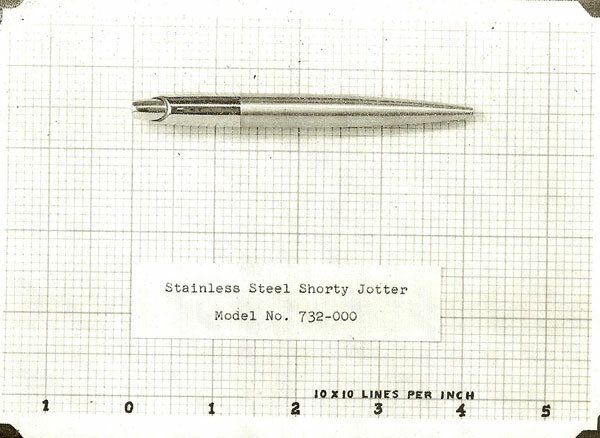 Bieger himself worked with several designs for Parker, especially developing desk stands, but he was also the man behind the Minim ball pen, developed in 1957.
he Minim was offered officially in 1958 in the US and 1960 in the UK, with bodies in the colours of black, grey, red and blue and also in two high end versions of 14k gold plate with longitudinal engraved lines, and, in the US only, a 14k solid gold in a plain smooth finish or barley was offered. 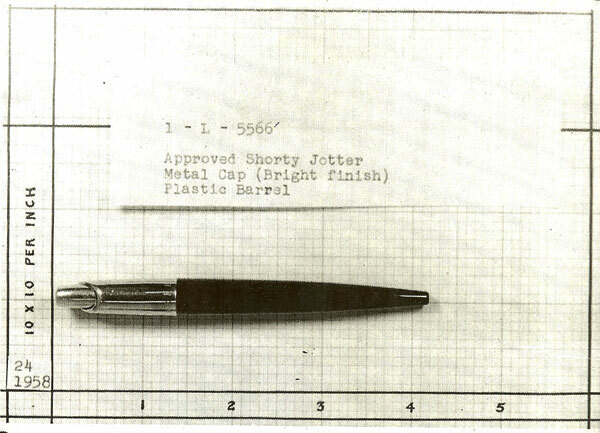 The earliest 1957 plastic versions were initially referred to as the Shorty Jotter and had stainless steel caps, but these were soon replaced on account of Dan Parkers notion that the ladies preferred gold. And the name was also changed to the more feminin "Minim." Walter Bieger remembers how Dan Parker came to him and said "Wally, what I'd really like to see, is a short pen for women, where the outside of the pen is no longer than the Jotter cartridge it contains!" 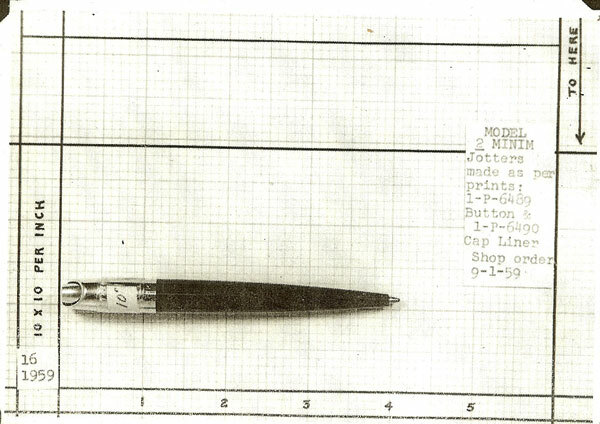 Walter Bieger replied "Okay", and went to work, designing the mechanism and the pen casing to go with it. Image ©2010 by and courtesy of Francis Meinhardt. 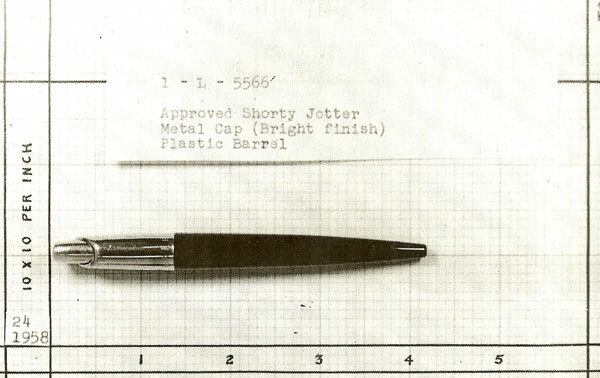 Two fabulous gold filled Minim, ca 1960.
o be able to fit a regular Jotter cartridge inside the pen, a new button-actuated mechanism was developed by Bieger where the button was situated partly on the side, rather than on the top of the pen. To eject the nib the button was pushed, and to retract it one touched the button on the side and a small feather pulled the nib back into the pen. 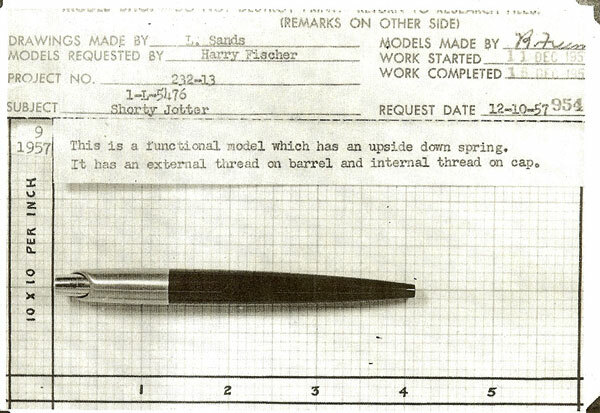 "Getting the springs to be effective in the minimal area allowed was the real challenge, but we worked it out in the model shop", Walter Biegel remembers. 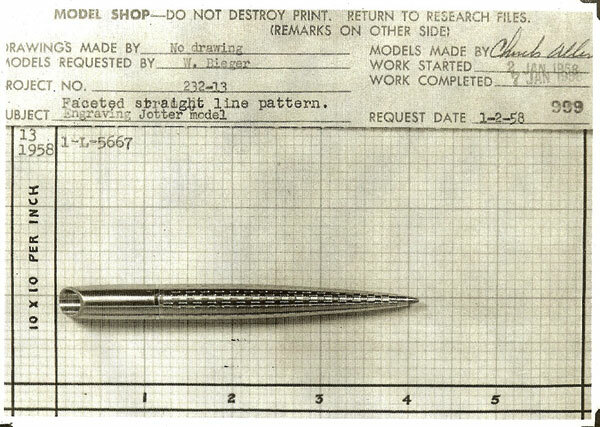 ally Bieger followed Rhoades and Doman's example and left Parker in 1959 to start his own industrial design studio. He was awarded some 30 patents after leaving Parker and about 400 of his designs came into production. Special thanks to Francis Meinhardt and Graham Hogg. 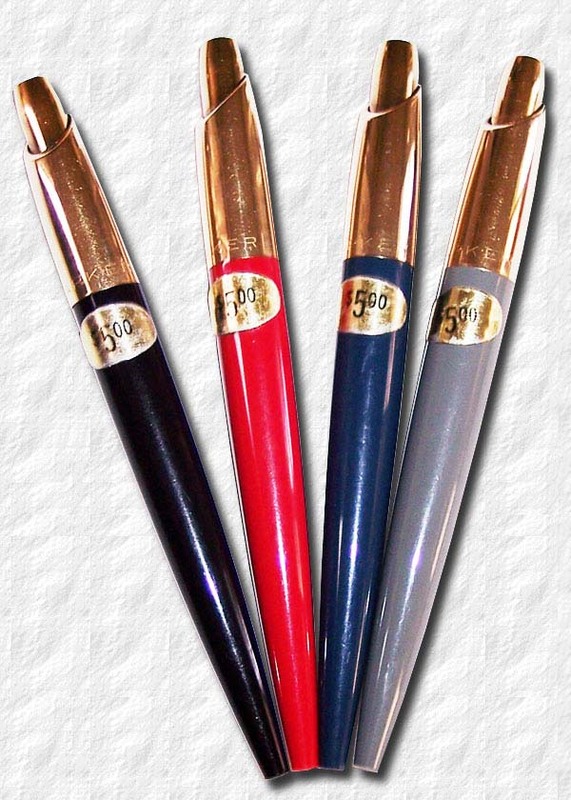 Parker in the four solid colours of black, red, blue and grey, ca 1960. Top one with enamel in a fish scale pattern. Under: a close-up of the top shell and unique mechanism. 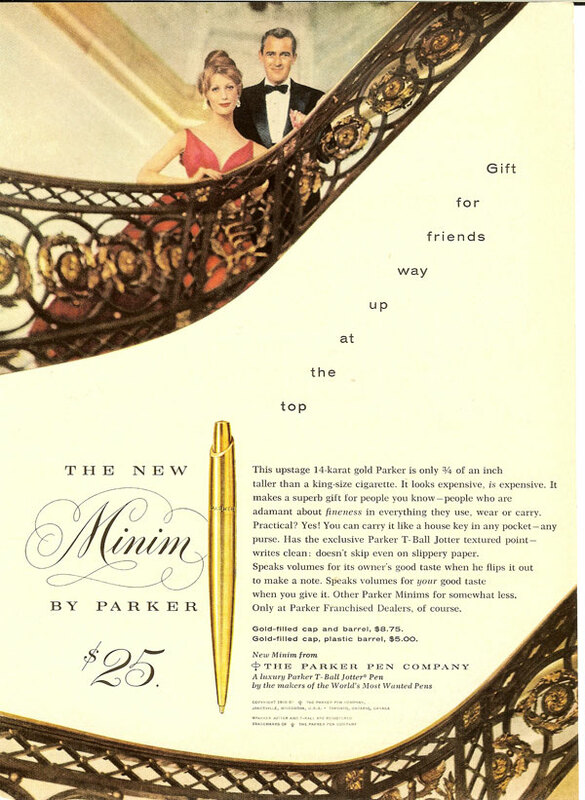 A 1958 ad for the Parker Minim. Image ©2010 courtesy of Francis Meinhardt and the Parker Archives. Images ©2010 courtesy of Francis Meinhardt and the Parker Archives. A selection of Parker Shop orders.